SPOKANE, Washington – In recognition of the 50th anniversary of the Gonzaga-in-Florence (GIF) campus and study abroad program, the McCarthey Family Foundation has pledged $1 million to establish an endowed scholarship fund to help ensure generations to come will experience this transformative educational experience in Florence, Italy. This will be the largest endowment associated with the program. 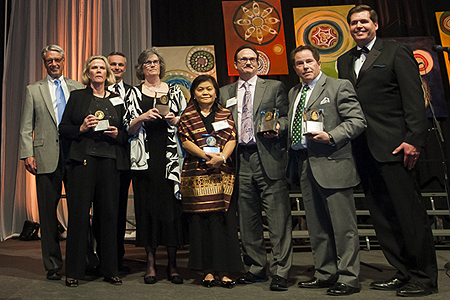 The family’s commitment was announced at the culminating 50th anniversary gala in Florence on April 26. The McCarthey family has numerous ties to Gonzaga as members of boards, parents, and alumni of the Gonzaga-in-Florence program. Four McCarthey siblings spearheaded this endowment and are proud GIF alumni: Thomas K. McCarthey, Jr., a Gonzaga Regent, is a 1973 Gonzaga alumnus (’69-’70 GIF); Philip G. McCarthey, a Gonzaga Trustee, is a 1974 GU alumnus (’72-’73 GIF); Sarah McCarthey (’75-’76 GIF); Maureen McCarthey is a 1982 alumna (GIF ’79-’80). Many other members of the family’s next generation also attended the Florence program. Sarah McCarthey said she “loved being part of the whole experience” in Florence. Specific memories include “hearing the bells of the Santa Maria Fiore on Sunday mornings; the taste of pompelmo; cappuccinos at the bar by the Palazzo Antinori; lone visits to specific rooms in the Uffizzi to spend time with Botticelli, Da Vinci, and Raphael; wondering about the scaffolding on Santa Croce that was there the entire year; walking up to Belvedere for the glorious view; singing ‘Wild Thing’ with Katey Brichto at the farewell party in Fiesole,” she said.